Closely related to the last post of peeves on the road is my list of peeves at the gas station. Gas hoses that are too short to reach around – Most modern cars have the gas tank opening on the driver’s side of the car, which is more convenient. Consequently, one side of the pump may be more busy than the other (if people are all going the same direction, like at Costco). 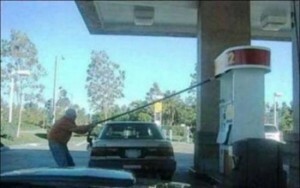 To save time, I get in the shorter line, and fill up by stretching the hose across the back of my car. However, in some primitive stations, the hose doesn’t reach. Lame. Talking gas pumps – the latest invasion of my space by advertising is video screens running some watered down version of CNN, interspersed liberally with ads. And they are pretty loud. When I am on a phone call or listening to a podcast on my blackberry, I can’t stand next to my car while it fills because this idiot box is blaring next to me. This is the latest, greatest insult of advertising since they started running ads in movie theaters. Refusing my credit card – I admit it, sometimes I use the card that is maxed out and it gets refused. But what really steams me is that the pump gives me this ‘please see attendant message’ and won’t clear for me to try another card for about a minute or more. I usually give the pump at least one frustrated punch w/ the heel of my hand while I wait. Don’t make me wait. ATM fees – at gas stations? They made having separate charges for cash v. credit illegal here in CA, but gas stations have found this way around the law – I mean, they have to pay a fee for when i use my credit card. Anyway, so long AMPM, you can keep your gas and the extra 7 cents per gallon hidden in the ATM fee. People that don’t pull all the way forward – this doesn’t happen that often, but when it does, it’s annoying – there are three open pumps, and some person decides to stop before pulling to the farthest one, which means someone has to go around them or wait while there is an open pump. What could such a person be thinking? Dirty squeegee water – this is probably my #2 pet peeve (after the talking pumps). When the water is soapless and smells like a mixture of diesel and dead animal, I am not happy. Lack of squeegees – Costco, are you listening? I love that you have the cheapest gas in town, but why, oh why, do you NOT let me clean my windshield? I’m sure you’ve thought about this, and want to keep things quick and simple, but I don’t like it. I’m surprised you even have garbage cans at the pump! Attendants that don’t speak English – I grew up in New Jersey, one of only two US states that still forbid self-serve gas – which means gas station attendants get jobs. Now, I worked as a ‘pump-jockey’ for a year, and hated it. We used to argue that such jobs were good for high school students, but now, they’re mostly held by Muslim gas-station owners. And usually, the guy barely speaks English. ‘Can I help you?’ can come out as nearly unintelligible garbage, and you just have to assume that they are asking for the grade and amount of gas you want. Did he just ask “Check your oil?” or did he say “we own the oil?” Is he laughing at me, or is that just a polite smile? Outdoor bathroom entrances – I’m not sure why, but having to walk around to the side of a gas station building feels crappy and unsafe. I much prefer indoor bathrooms. And PLEASE, don’t make me get a key connected to a tire iron. My only pet peeve with gas stations is the price of gas.